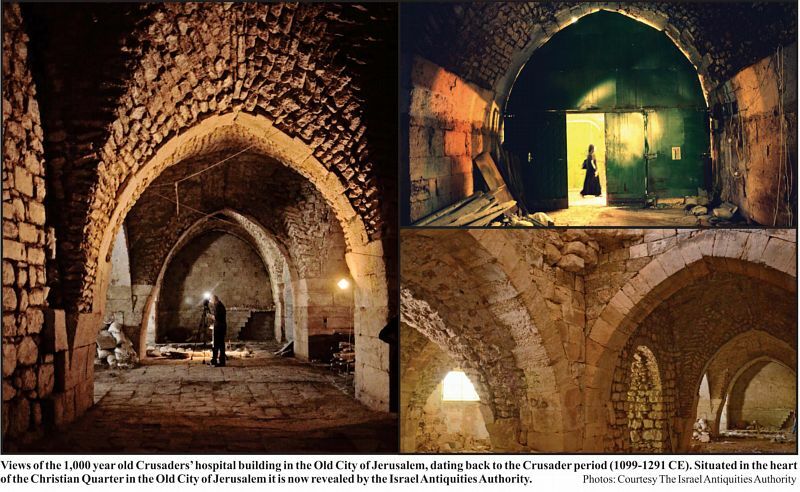 Part of an enormous structure dating to the Crusader period (1099-1291 CE), which was a busy hospital, has currently been revealed to the public following excavations and research by the Israel Antiquities Authority there in cooperation with the Grand Bazaar Company of East Jerusalem. The building, owned by the Waqf, is situated in the heart of the Christian Quarter in the Old City of Jerusalem, in a region known as "Muristan" (a corruption of the Persian word for hospital), near David Street, the main road in the Old City. Until a decade or so ago the building served as a bustling and crowded fruit and vegetable market. Since then it stood there desolate. In the wake of the Grand Bazaar Company's intention to renovate the market as a restaurant, the Israel Antiquities Authority conducted archaeological soundings there. According to Renee Forestany and Amit Re'em, the excavation directors on behalf of the Israel Antiquities Authority, "We've learned about the hospital from contemporary historical documents, most of which are written in Latin. These mention a sophisticated hospital that is as large and as organized as a modern hospital. The hospital was established and constructed by a Christian military order named the "Order of St. John of the Hospital in Jerusalem" and known by its Latin name the Hospitallers (from the word hospital). These righteous warriors took an oath to care for and watch over pilgrims, and when necessary they joined the ranks of the fighters as an elite unit. The hospital was comprised of different wings and departments according to the nature of the illness and the condition of the patient - similar to a modern hospital. In an emergency situation the hospital could accept as many as 2,000 patients. The Hospitallers treated sick men and women of different religions. There is information about Crusaders who ensured their Jewish patients received kosher food. All that notwithstanding, they were completely ignorant in all aspects of medicine and sanitation: an eyewitness of the period reports that a Crusader doctor amputated the leg of a warrior just because he had a small infected wound - needless to say the patient died. The Muslim Arab population was instrumental in assisting the Crusaders in establishing the hospital and teaching them medicine. Arab culture has always held the medical profession in high regard and Arab physicians were famous far and wide. According to Monser Shwieki, the project manager, "The magnificent building will be integrated in a restaurant slated to be constructed there, and its patrons will be impressed by the enchanting atmosphere of the Middle Ages that prevails there". According to Shwieki, "The place will be open to the public later this year".